The Kennel Club runs a scheme that recognises a high ethical standard from breeders who have been accepted by the Kennel Club on their Assured Breeder Scheme. I am proud to be a member of this scheme. Assured Breeders will always ensure that the correct health checks are carried out before the Dam is mated. 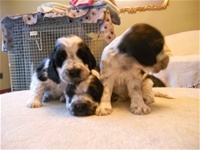 I would advise anyone who is looking for a puppy to look out for a breeder that is an Assured Breeder. Although there is never 100 per cent certainty that a puppy will be born healthy, as with humans or any other animal unfortunately nature has it that occasionally things go wrong. However, as an Assured Breeder I can assure any future puppy parents that all health checks will have been carried out in an attempt to ensure that all pups are born healthy and stay healthy throughout their lives. For more information about the Kennel Club Assured Breeder Scheme, please see my front page for the link that will take you to the Kennel Club Assured Breeder Site. You may have been thinking about getting a puppy for some time but you want to be sure that you are making the right decision. Are you ready for a puppy to join your pack? There are several things that you need to consider; do you have someone at home most of the day? Puppies and grown dogs alike can get lonely, they are pack animals and if left alone can become destructive and develop behavioural and social problems. I would kindly advise you to visit The Kennel Club - Getting a Dog section and in particular the Assured Breeder Scheme (information for pedigree puppy buyers). You may be interested to know that I will be asking you many question that will include; whether you have the time to look after a puppy/dog, that will include walking, exercising. Whether you can afford to keep a dog, insurance, vet bills, even if your dog is fit and healthy, you can expect at least one annual vet bill for vaccinations. All dogs will require grooming, even those breeds who do not have fur will require skin care. A spaniel will require regular grooming otherwise knots and tagles will ensue. You may be interested to know that both Dam and Sire are DNA tests prcd-PRA Hereditarily Clear. Dam and Sire have wonderful temperaments and this is evident in the puppies. All puppies are handled by our family and will be used to the noises of a busy household. They will be wormed at 2, 4, 6 and 8 weeks. They will have a full health check with their first vaccination before they go to their new home. They will go with a minimum of 4 weeks free pet insurance and a puppy pack that includes: food, a money off voucher, poo bags and plenty of advice literature. The literature will include advice on; socialisation, grooming, worming, feeding, exercise, immunisation and information regarding tendencies and traits of the breed. All puppies will be micro-chipped (a legal requirement from April 2016). Help and advice will be available throughout the dog's lifetime, just a phone call away. Any information regarding test reports will be available for inspection upon request. Puppies will be available to go to their new homes from eight weeks old. Viewing from four weeks old, by appointment only. I am contactable via phone or email. home phone will not take withheld numbers. Just a few words about the cost. A few days ago I came across a person who had purchased a cocker spaniel puppy off Gum Tree. He paid £400 for the pup. When I looked at the puppy I was surprised at how small he was – about the same size as my puppies who at that time were four weeks old – his pup was 10 weeks old (allegedly). At least he had the sense to take the pup to the vets. The vet told him that the pup was 6 weeks old (far too early to be taken from his mum). The pup hadn’t been wormed, vaccinated, micro-chipped and the new owner had no information regarding, socialisation, grooming, feeding, exercise etc etc .. And to top it all, the pup has a heart murmur. To date the new owner has paid £750. And he hasn’t got a healthy pup and is unable to trace the person who sold him the pup. (poor little pup) Whether or not you purchase one of our pups isn’t for me the issue – but please if you buy a puppy – please buy from a responsible breeder.